Few experiences are more awe-inspiring than seeing American bison in the wild. Bison are the largest land mammal in North America, weighing up to 2,000 pounds, and it is truly a magnificent sight to watch a thundering herd crossing the grass-filled plain or a baby bison grazing alongside its mother. Our wildlife experts are keeping close tabs on wild bison populations. Here they share their picks for the best places to watch wild bison this summer! A massive bison bull surveys the herd from a ridge in Yellowstone’s Hayden Valley. Photo by National Wildlife photo contest entrant Sandi Sisti. Yellowstone is the only place in the United States where wild bison have lived continuously since prehistoric times. These bison are genetically pure – not bred with livestock – and are the descendants of only 100 or so bison that remained in the 1880’s after decades of slaughter brought the species to the brink of extinction. 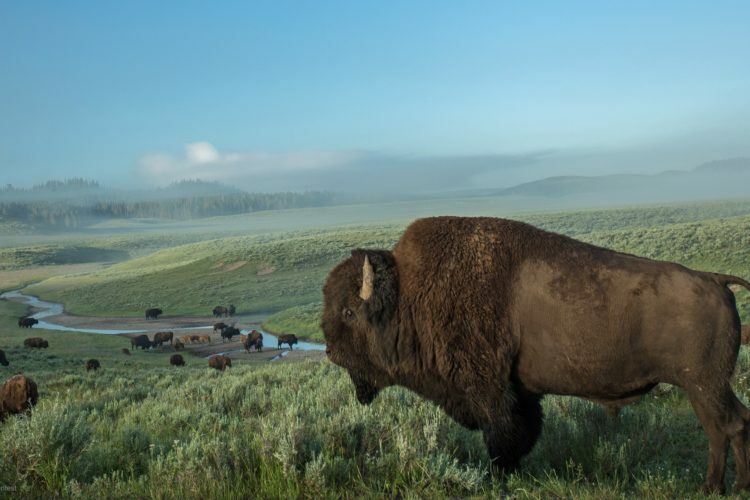 Approximately 4,900 bison roam freely over the park’s expansive landscape. Thanks to friends of wildlife, they now have expanded habitat to roam a little further outside park boundaries. Learn more about a visit to Yellowstone to watch wild bison. Wild bison a year after they moved from Yellowstone National Park to the Fort Peck Indian Reservation in Montana. Photo by Alexis Bonogofsky. Fort Peck is home to the Assiniboine and Sioux, tribes with a long cultural and ecological connection to bison. The tribes welcomed bison back to these lands in 2012 after a century of absence. Now numbering 250 and roaming the windswept hills of the tribal lands, Fort Peck bison are also descendants of the genetically pure Yellowstone bison. In a few short years, the bison are already reviving the landscape’s ecosystem, with grassland birds returning and native prairie grasses thriving. Contact the Fort Peck tribes to find out about visiting their bison herd. The Henry Mountains herd is one of only a few free roaming, genetically pure herds remaining on public lands in North America. Photo by Gerald Cook, Bureau of Land Management. The Henry Mountain bison herd roams over 300,000 acres of steep mountain slopes, foothills, flat mesas and deeply eroded canyons in southern Utah. In 1941, the Carbon Emery Wildlife Federation, the Utah State Department of Fish and Game and the National Park Service transferred three bulls and 15 cows from Yellowstone. Today the herd is approximately 340 adults and calves. The Ute Indian Tribe reintroduced bison near Book Cliffs where today you might see this wild herd as they make their way in the desert mountains, canyons and along the sandstone buttes of this remote wilderness. Find out about travel to Utah for bison-watching. Bison calves sampling native prairie plants at the Rocky Mountain Arsenal National Wildlife Refuge. Photo USFWS. Located just 8 miles from downtown Denver, the Rocky Mountain Arsenal National Wildlife Refuge is a 15,000-acre expanse of prairie, wetland and woodland habitat. It’s one of the largest urban wildlife refuges in the nation and last year more than 330,000 people came out to catch a glimpse of the herd of 87 wild bison who live there! This year, the area for bison to roam will be expanded so you may be able to see them from the road to Denver International Airport. Get more information to plan a visit and see the bison at Rocky Mountain Arsenal. Surprised that wild bison roam Alaska? Scientists believe bison were once the most common land mammal in the state, but disappeared about 500 years ago. A small herd was transferred from Montana in 1923 to Delta Junction, and has grown to about 400 free-ranging bison today. The wild bison herd is frequently visible throughout the summer at an overlook near the Black Rapids overlook at Milepost 225.4 on Alaska’s Richardson Highway. See about taking a trip to the official end of the Alaska Highway to watch wild bison. Adopt a Wildlife AcreHelp give bison more room to safely roam their natural habitat! 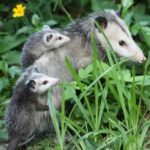 Adopt a wildlife acre today.